We are well beyond the web of documents, and are no longer accessing the web to simply read it. As users we want to do things with it, on it, through it. We are engaging with the internet at a logarithmic scale. And at the same time, the way we engage with the Internet is evolving at an even faster pace. You no longer have to sit at your desk, alone, to browse the web. You can access the internet from your PC, your tablet, your phone, your watch, your car… Your fridge?!? These dual trends mean that users are expecting more. So what can brands do in order to stay up to speed, and continue to offer an advertising experience that enriches the search experience, rather than look out of p(l)ace, and see their business ultimately penalised? Amongst the most disruptive, and yet dispersed, experiences, voice search is something that should have already whispered to marketers’ ears that there is an opportunity was to be captured. There are millions of Cortana, Siri and Google Now-enabled smartphones allowing users to voice their intent. But this installed base is about to rocket from July 29th, as Microsoft upgrades for free hundreds of millions of PC to Windows 10. 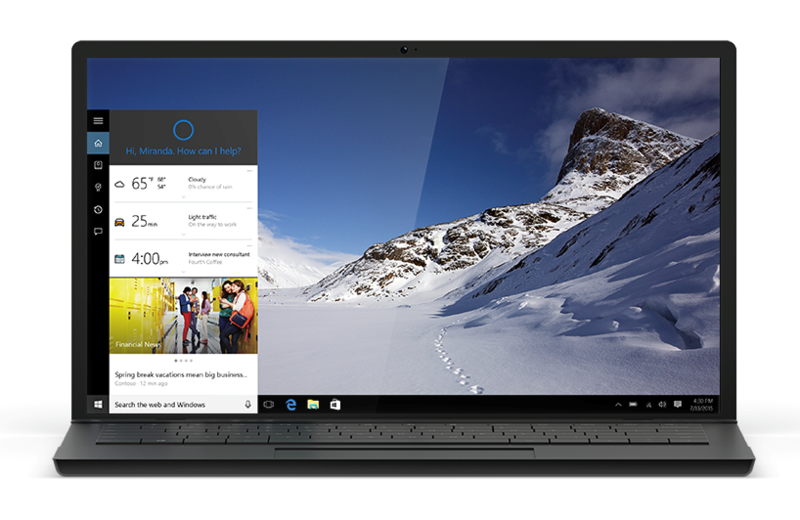 Microsoft’s latest operating system comes pre-installed with Cortana, a voice-activated personal assistant that can search the web, your files and your cloud without having to start an internet session, or type a word. The personal assistant concepts are search experiences in their own right as they give you access to information whilst contextualising their results based on your location, the time, your needs… As a matter of fact, Siri uses Bing for web search whilst Cortana leverages Bing’s information architecture, voice recognition and machine learning capabilities to provide relevant recommendations, fast access to information and important reminders. For this article, I will not dwell on the personalisation of the results that such an experience enable, but I will rather explore the impact for advertisers of voice input on a smartphone, and soon on a PC. Today, search marketing platforms do not offer the opportunity to target the audience based on the input method (such as voice or text), but there are some notable differences between voiced and typed queries that you can act on now. Voice search is by default more mobile and local than text search, which is self-explanatory due to the devices which enable such functionality. But the more polarising factor is the fact that voice search is conversational. With text-based search, you would enter something like “Tesco” and you would click on the address to find its location. With voice search, you will more likely say, “Where is the nearest Tesco?” You explicitly ask a question rather than expect the algorithm to make sense of a couple words based on a few signals. 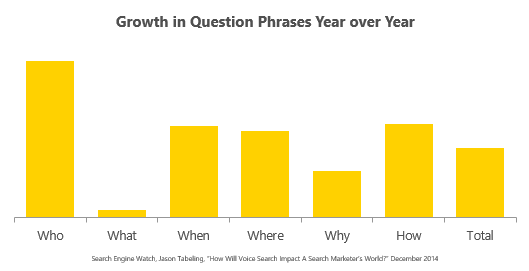 Recently, search agency Rosetta published an inspiring article that shared the unique idea that voice search is characterised by question words: Who, what, where, why, and how. These question phrases may give us vital clues that text-based searches don’t have. For instance, the same keyword “Chicago” combined to different interrogative words relates to very distinct intents: Who is Chicago? A band. Where is Chicago? In Illinois. What is Chicago? A musical. 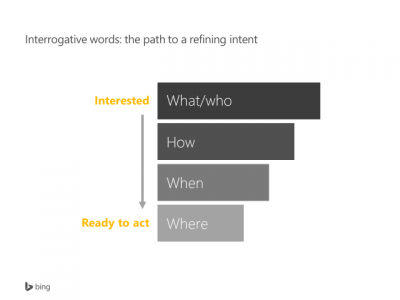 First recommendation to optimise your PPC campaign for voice search: use interrogative words in your keyword portfolio (and turn the less relevant into negative keywords). Pulling a search term report is a great place to start, but make sure to consider the nuances of keyword associations: “What price” is likely to have much stronger intent than a general “what is” query. Step 2: Grab voice search by the tail. The conversational nature of voice search has further implications. The team at Bing Ads carried out some research which surfaced that with typed input, two-word queries are the most common, with a steep decline in over-three-word queries. 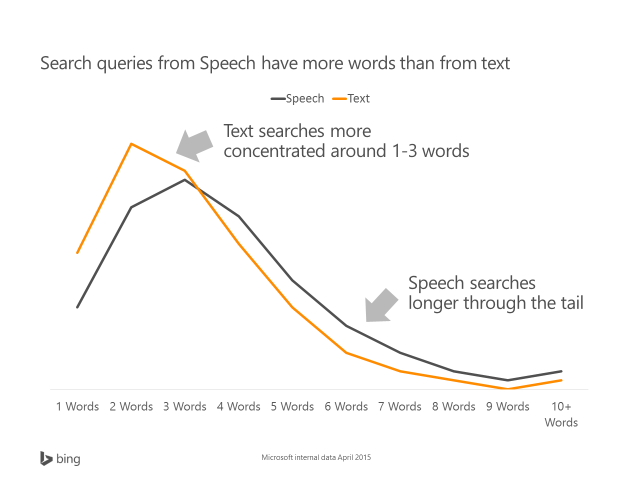 With voice search the most common query length is three and four words, with a slower decline in query length from there. This is understandable as, for most humans, speaking is a lot easier than typing each characters with fat fingers and a chronical tendency to typos. My second recommendation is thus to analyse your longer tail keywords to find patterns, some that may stretch up to 6 and 7 words in length. This will have both a positive effect on your ad affinity to the user intent, and your bid strategy. However, and this is my final recommendation, I would certainly not discard the head of that curve, which is over-indexing in branded terms. As expected, we saw in the research that the 30 top clicks went to 30 brand names, unsurprisingly. So continue to invest on these terms which are critical for brand building as much as for transactional traffic. What to expect from Voice Search in the future? 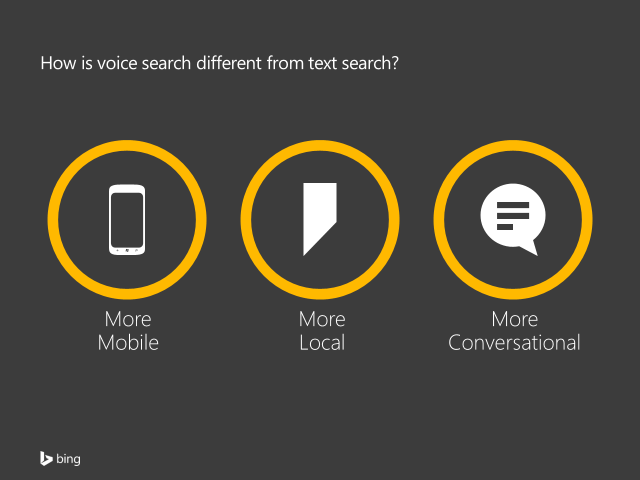 As voice search becomes more ubiquitous, we should see new search behaviours emerge. It should become less mobile, and probably less local as a result, but I would expect it to remain more conversational, hence the drive towards semantic. We should also expect a democratisation of a functionality that over-indexes amongst the younger audience (71% of the 18-29 year old American are using a mobile personal assistant versus 39% for people aged 44 and over according to Emarketer). For marketers, more targeting options may rise and new ad formats are more than likely. Until then, my three search marketing recommendations will help you capture the voice of your customers and turn it into music for your ears. Tasked with promoting Microsoft’s search marketing platform - Bing Ads – around the world, Cedric works closely with advertisers, from Blue Chip brands to small businesses, to help them develop effective online strategies which can boost their visibility with PPC, provide more targeted communication and deliver higher ROI.